Concluding the three friendly game series in preparation ahead of their return to league duties, Hilderinc FC produced a sublime performance against Band of Brothers FC, which included a wild final seven minutes when the Blacks were reduced by two for copycat but out of character cantankerousness aimed at the referee. While experimenting with personnel the last couple of weeks, the Blacks limited the tinkering with a settled lineup, though there were adjustments made to the overall game management in mind. Bolstered by a complete squad, which had two players at every position, the Hilderincs were in a confident but focused mood, with eyes firmly fixed on next week’s opponents as much as they had their immediate challengers in mind. Despite that, it was a tentative start to the game by the Blacks, who though were denied an early penalty when Xerxes Lee was clattered in the box, they needed Lim Yong Kiat’s save to ensure they were not punished for a mix-up after the Brothers launched a quick counter-attack. However, the initial wobble was instantly replaced by their usual confident self as they passed into control of the game. With attempts from Xerxes Lee and Erdogan Albay whizzing past the target, the first chance of the game fell to Ian Morris, whose effort was kept out by an alert goalkeeper. But after dominating with their lively play, the Blacks went ahead with a goal built up in the highest order. Capping the possession play, Erdogan Albay sent a delightful cross-field pass to find Glenn Sandhu on the far right, and with the rightback, as he did last Sunday, finding pace intelligently behind the backline, drew the goalkeeper out to cutback for Ian Morris to apply a simple tap into an open net for the lead. 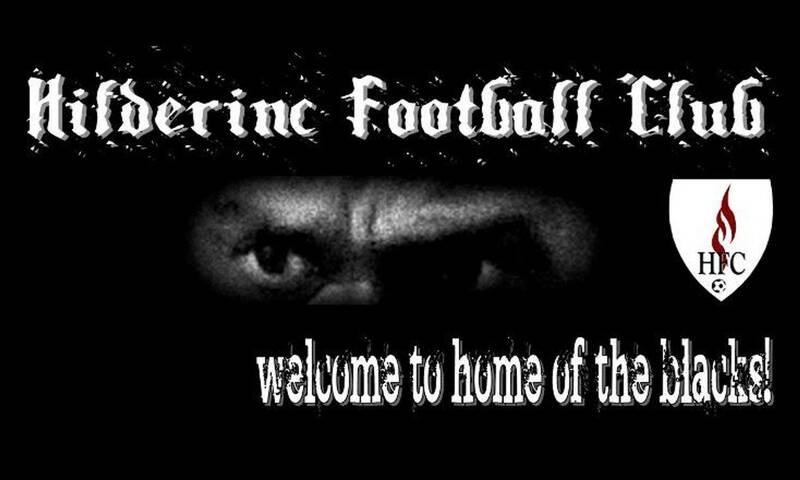 Notwithstanding the lead, the Hilderincs were in full motion with their fluid football, at times delighting with one touch pass and move football, craving the opponents are willing, proving that they are at their best with the ball at their feet. 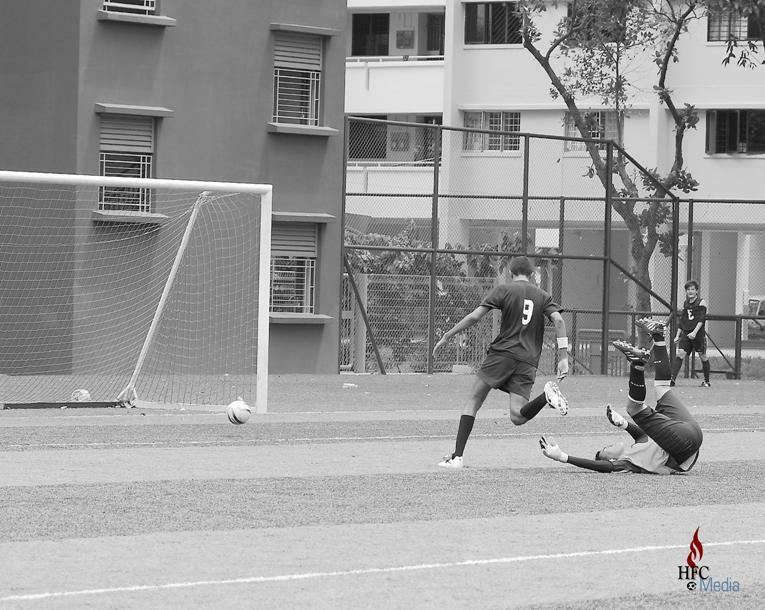 It was then no surprise that the Blacks increased their advantage with a passage of play that was started by Lim Yong Kiat in goal, progressing with Mike De Bear and Ian Morris, before Danish Saarin’s deliciously threaded ball was diverted into the path of Logaraj Sundram to sweep pass the Brothers’ keeper to amplify their supremacy. There was no letup in the Hilderincs intent in the second half as they carried on with where they had left off before the break. Playing with quick crisp passing football, the Blacks were in their element as they tried to put the game beyond the reach of the opponents, and could have ended any contest with goal or two in the opening minutes, if they had chosen the decisive over pretty finishing. Though far efforts from Ian Morris and Erdogan Albay signaled towards a steady pattern, a penalty against the run of play provided a lifeline for the Band of Brothers, and important lessons for the Blacks. However, the resultant spotkick was balloon high and well over the crossbar, though Sunny Tharidu stood tall, reading the taker’s mind well. Thankful to have their advantage undisturbed, the Hilderincs reassumed with their temporally disrupted rhythm, pressing to extend their lead. And as it was with their previous two, good buildup play and a deadly through ball by Xerxes Lee allowed Ian Morris to slam in his brace at the near post to give the Blacks a comfortable three goal lead, and bringing him within two goals of the great Stepan Lobov in this season’s HFC goal scoring charts for the Club in all games. With the game entering into the final quarter, one who have expected the Hilderincs to canter to finish, but as always, the Blacks are one for self-induced excitement, though credit should be given to the Brothers for not giving in without a fight. They first got one goal back with a well take goal, and were awarded a second penalty by the referee, a much softer one at all means as compared to the first one, which was the more legitimate one. Like the earlier spotkick, Sunny Tharidu did excellently to read the direction for the kick, but was unfortunate to be beaten by the pace and power behind it, but the defender turned bona fide keeper was credited in keeping the Hilderincs lead intact with a fine stop not all after. As if unsatisfied with the thrilling finish, the Blacks were reduced to nine-man after Mike De Bear and Danish Saarin were shown the red card, minute of each other for their petulance against the referee, whom they took offence with for not showing them enough protection, though the Brothers also had a player matched off for the incident involving the former. Though a mild skirmish threaten to bow over, composure prevailed and the good competitive contest was allowed to finish without an incident. Tougher struggle will be provided by Snipers FC next week when the Blacks face the runaway league leaders, but with their season at a crossroads, the Hilderincs will take inspiration in the three highly productive friendlies to spur them on.